Dr Lloyd Donaldson (Scion, Rotorua, New Zealand). 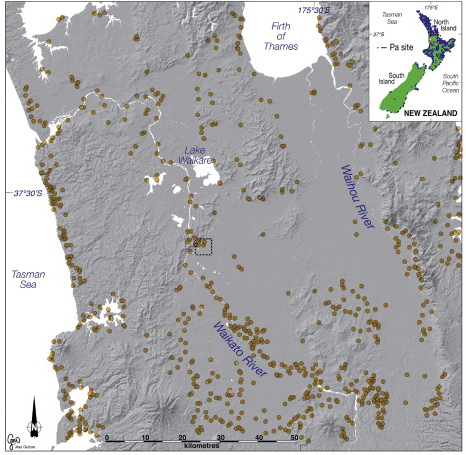 Pā (Māori forts) are a dominant element of the North Island archaeological landscape, but they are poorly understood archaeologically, with systematic investigations hampered by the relative lack of precision when radiocarbon (14C) dating between ca. AD 1500 and European arrival in New Zealand. Here we present wiggle-match calibrated ages for three palisade posts from Otāhau Pā in the Waikato region (Fig 1 a) and assess the value of this approach to improve calendar ages for Māori pā. The distribution of Waikato region pā sites. Otāhau Pā. Posts extracted for analysis shown in black. Radiocarbon wiggle-match dating refers to the fitting of several 14C data points of unknown calendar age from a constrained sequence (e.g. tree-rings) to a 14C calibration curve. Matching of the data to the wiggles in the curve significantly improves the precision of the calibration, and also reduces the influence of minor offsets which can result in a wide spread in calibrated age. Wiggle-matching works best with trees that put on annual growth rings. Ideally ring widths should be established from multiple trees to identify missing rings. Bark (or at least sapwood) must be present. The wood must be reasonably well preserved to minimize contamination. Trees being dated need to be large enough to show the same pattern of wiggles as the calibration curve. The accuracy of the wiggle-match may be compromised by laboratory biases and calibration curve errors. This can be assessed by measurement of known-calendar age tree-rings by the measuring laboratory and comparison with the official calibration curves. A series of palisade posts is visible from the north-western tip of Otāhau Pā and along its north-eastern side (Fig 2 a). 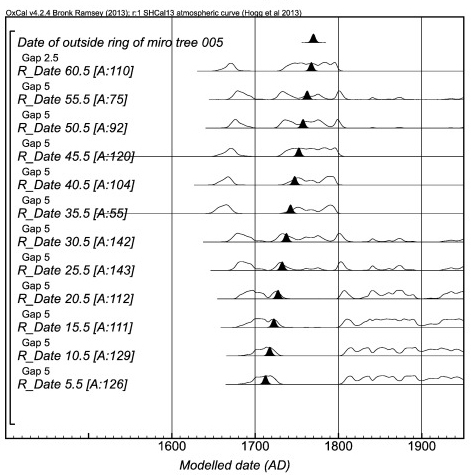 A miro post (005) was sampled for tree-ring analysis and14C AMS dating. To investigate the consistency between the Waikato AMS miro post 14C measurements and the data in the Southern Hemisphere Calibration curve (SHCal13; Hogg et al. 2013), we compared the miro results with 14C levels in known-age – as determined by dendrochronology – 5-ring blocks of New Zealand kauri (for the interval AD 1650-1829). We then utilized the Bayesian approach to wiggle-matching using the OxCal D_sequence command (Bronk Ramsey, 2009, Bronk Ramsey et al., 2001). Series of palisade posts visible from north-western tip of Otāhau Pā and along its north-eastern side. Palisade post 005, Otāhau Pā. This post (Prumnopitys ferruginea, miro) was ~ 1.6 m long and 165 mm wide with bark remaining, with a chiseled base. The model for the 12-sample post 005 (Table 2, Fig 3 c) has good overall agreement (Acomb = 18.4%, An = 20.4) and estimates the final ring of the sequence to have been formed in AD 1765-1775 (AD 1768 ± 4). Fig. 4 shows the positioning, as determined by the wiggle-match, of each of the twelve 14C dates. Posts 009 and 003 were dated to determine if all the miro trees were felled at the same time and to investigate the levels of precision associated with utilizing lower, more cost-effective, sampling. Wiggle-match results comprising the two innermost and two outermost 5-ring dates are given in Table 2. The wiggle-matches are still accurate and reasonably precise, with 1σ errors for the calibrated mean ages of 10–14 years. This late 18th century date for the pā is younger than estimated by kaumātua (Māori elders) from nearby Taupiri Marae. They had no oral traditions about the period of site occupancy and therefore expected the pā would have been much older. It is possible that hapū (clan) from a different kinship group occupied the site 250 years ago or that details of the traditional history were lost as a result of European colonisation. A more detailed investigation into the oral history of the Greater Waikato region is required in order to identify the original hapū who built the pā. Table 2, Fig 3 (c) below. Probability distributions of dates from miro post 005. The distribution represents the relative probability that an event occurs at a particular time. For each of the dates, two distributions have been plotted: one in outline, which is the result of simple 14C calibration, and a solid one, based on the wiggle-match sequence. The distribution “date of outside ring of miro tree x” is the estimated date when the tree was felled. Miro post 005 radiocarbon ages (1σ errors) as fitted onto the SH calibration curve SHCal13 by wiggle-matching. 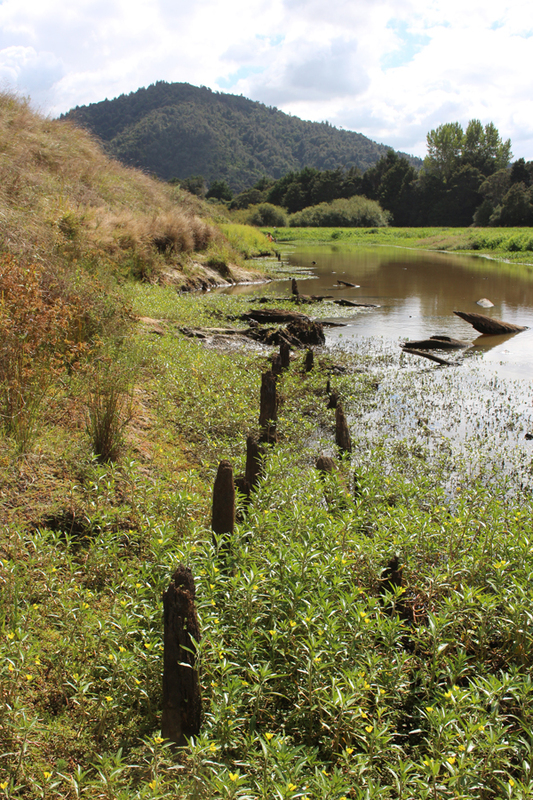 This study shows that 14C wiggle-matching results in calendar-ages for wetland pā sites of unsurpassed accuracy and precision. If this result can be repeated on other sites, and if there is comparably detailed analysis of relevant oral traditions, then for the first time in New Zealand we might be able to write a rich material and social history of a region in the period before European observation. Hogg, A., Hua, Q., Blackwell, P., Niu, M., Buck, C., Guilderson, T., Heaton, T., Palmer, J., Reimer, P., Reimer, R., Turney, C., Zimmerman, S. 2013. SHCal13 Southern Hemisphere Calibration, 0-50,000 yrs cal BP. 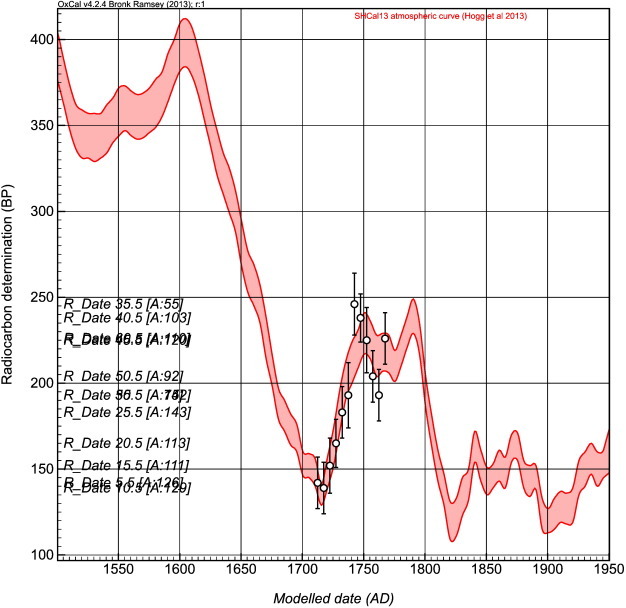 Radiocarbon 55 (4):1889-1903. This case study was supported by a Strategic Investment Fund grant from the University of Waikato. We wish to thank Joe Barton and the Taupiri Marae Committee for their support and encouragement in sampling the posts from Otāhau Pā. We also thank Rudy Van Dam, the NZ Transport Agency, the Waikato Raupatu River Trust and Heritage New Zealand for their assistance. Intcal13 and SHCal13 calibration datasets now available. Video: KuDos Science Excellence Award nominee Kathleen Dabell talks about the Radiocarbon Dating Lab and her Advanced Technical Officer role.